The breakfast room is light and sunny and on warm summer mornings the doors open right back to take in the view and enable you to feel as though you are breakfasting outside. The all important start to your day. A buffet of fresh fruit, granola and muesli, fruit juice and cereals, followed by a menu offering local sausages, bacon and – of course - free range eggs. How about creamy scrambled eggs with some smoked salmon, Poached eggs on toast or perhaps some boiled eggs and soldiers. We use Fairtrade, local and organic products wherever possible. Our breakfast menu is varied but if you have a special diet we will happily accommodate what you need if you email us beforehand. 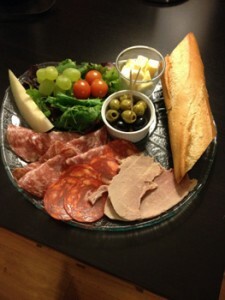 Platters should be ordered pre arrival or at Breakfast so we can source the best ingredients during the day. Ideal if you are off for a walk on the moor or perhaps to sit by a quiet moorland stream with one of our lunches. We offer scrumptious sandwiches, accompanied by fruit, crisps and home made cake. These should be ordered the evening before. There is also our village pub, just 5 minutes walk from the house so after a long drive there is no need to take to the road again. Our information books in each bedroom also provide you with lots of alternatives for lovely places to eat around the area. Keep in Touch and Follow us!